Freedom in a democracy is freedom which balances different values (privacy, creative expression, good name, the right to information, security, and integrity) and ultimately, it is the court’s role to define the boundaries, which cannot be surpassed. For art, such movable boundaries are set by the current aesthetic canons and the law. Aesthetic canons protect the sensibility of consumers whereas the law protects the values recognized by the law as more important than creative freedom. If art breaches such canons, the limits within which such breach is permitted is described by the law and applied by the courts. In 2001, During the Salzburger Festspiele (the famous summer season of music and theater), there was a scandal. Die Fledermaus of Johann Strauss (Music) and Karl Haffner and Richard Genée (text) were staged. This very popular, light, unpretentious play, is considered due to its musical qualities, not only as the “Vienna Operetta” (which it in fact is), but even as a comic opera. It is thus exhibited from time to time in the “big” opera houses, with first-class singers. The director, Hans Neuenfels adapted everything in his own way. The case has been referred to the courts in Salzburg (Austria), by lawyers-viewers claiming that they saw and heard something different from what they have purchased tickets for. The case is even more interesting as it has been initiated by the viewers themselves. Typically, the freedom of the producer is in conflict with the interests of creators. The authors discuss this matter as well as other examples of laying out the boundaries of freedom of directors and creators of the opera. Freedom of staging as opposed to the protection of viewer’s interests – a dispute over the staging of Fledermaus of Johan Strauss by Hans Neuenfels. 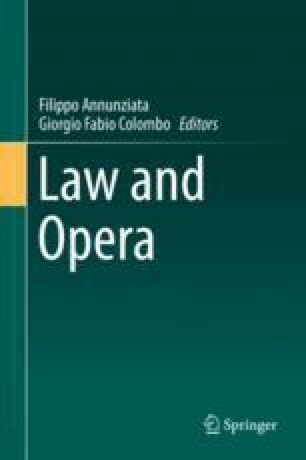 Both authors as Acus published a book about opera and the law (Wolters Kluwer, Warsaw 2013).